Most people don’t understand the pros and cons of offset printing versus those digital printing—but we’re not blaming them. It’s not exactly the most exciting topic out there and it certainly isn’t trending in Twitter. Plus, we’re printing geeks, so we should know them. Most organizations have a significant need for printed materials—envelopes, letterhead, forms, marketing materials, business cards, presentations—so it’s important to get a decent handle on how to purchase these materials in the most effective way possible. Offset printing is done on printing presses. Why do they call it offset? It’s anyone’s guess, but Google can surely help if you’re dying to know. Digital printing is typically done on high-end copiers—so high end, in fact, that they change the name from copiers to “digital press.” Offset printing is ink on paper, whereas digital printing is toner on paper. Now for the pros of each—we’re skipping the cons because we’re glass-half-full kind of people. Quality: Any printing professional would not debate the fact that offset printing produces a much higher quality product. That quality gap is widened when the process is performed by highly skilled pressmen and presswomen. That being said, the quality gap between offset and digital has been narrowing year after year. Is there still a difference? You bet. Will the people that receive or handle the printed material know the difference and care? I am sure there are instances where it absolutely matters, but let’s not fool ourselves into thinking it matters in every case because it just doesn’t. You may equate the difference to listening to a record versus listening to a CD (don’t get me started on the lack of sound quality in streaming music)—there is certainly a difference but it isn’t always easy to equate and while some people swear by their vinyl, the masses prefer a more digital approach. Cost: If you’re planning on a large quantity (at least 1,000 if not more like 5,000+) of prints, there’s a decent chance you’ll save money with an offset printing approach. 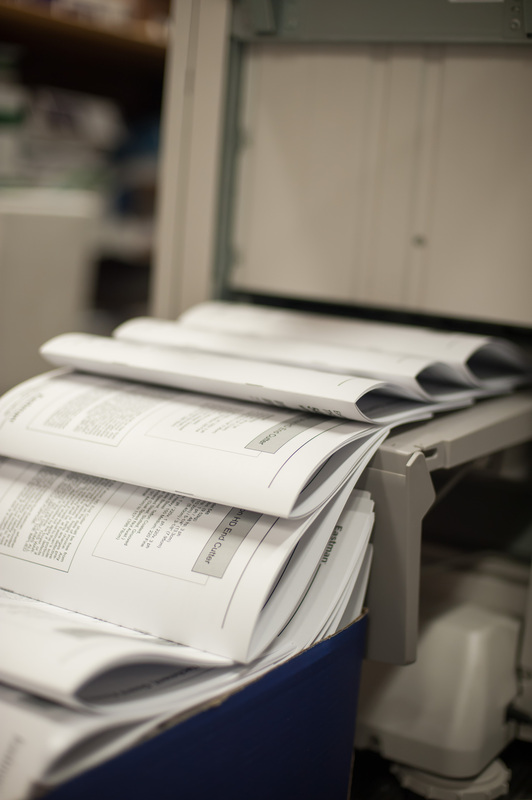 Short runs become cost prohibitive for offset printing as the setup is significant in comparison to digital print. If you are printing 1,000,000 postcards for your upcoming political campaign, you want offset. If you are printing 200 invitations to your customer appreciation event, go digital—the costs aren’t even close. Turnaround: Where offset printing typically takes at least a few days if not longer, digital printing can be (theoretically) started in a few minutes. We’ve built our company around the rush needs of our clients. You procrastinated? No problem. You took every last minute possible to perfect your presentation? No big deal. Whatever the reason is, turnaround is much faster than offset printing. Changes: If your company is like ours, things change. Frequently. We are adding people, services, offices—you name it—quite frequently. The speed of business today is lightning fast and frankly, in most cases, it just makes more sense to print short runs of materials so that you don’t end up with a warehouse full of marketing materials or stationery that has your old logo, address, or whatever all over them. Digital printing allows you to stay nimble and make the changes to your materials on a whim without wasting money. Assembly: For collated projects with a lot of assembly (think training binders with tabs, or short runs of large packets), digital printers are able to collate as they go and save significant time and, thus, enhance the cost gap for short runs. Advantage digital. Cost: Cost is opposite of assembly—if you have a short-run project, the lack of a lengthy setup process allows for more cost-effective printing of smaller projects. Your first brochure printed digitally may cost you a couple bucks, whereas your first brochure printed offset will cost you at least a couple hundred bucks. Sure, there’s a gray area where costs start becoming comparable, but there’s no hard line on what volume that is. Every project is different and would have to be evaluated on a case-by-case basis. However, for anything less than 1,000 it’s not going to be close so you probably don’t really need to compare. We’re not doubting your knowledge prior to reading this post, but now we know you’re totally ready to crush that digital printing Jeopardy category—or at least make better buying decisions when it comes to your company’s printed materials. As always, we’re happy to discuss how these ideas apply to your current or upcoming projects; call us! We know our stuff.